Both adults green to yellow/green in general; blue/green crown; pale gray lores, chin and cheeks to ear coverts; dark blue primary coverts; orange/red underwing coverts and axillaries. Bill horn in colour with orange/brown tint. Eye ring bare and grey/white. Eye dark brown. As in adults but with green crown without blue wash. Bill darker brown. Calls made in flight are rapidly repeated trill notes. Calls while perched are shrill and unsong-like. Quiet otherwise. Parrots: Status Survey and Conservation Action Plan 2000-2004, Snyder, McGowan, Gilardi and Grajal, 2000. Fruit such as: apple, pear, orange, banana, cactus fruits, pomegranate, forming about 30 percent of diet; vegetables such as: carrot, celery, green beans, peas in the pod; fresh corn; green leaves such as: Swiss chard, lettuce, sowthistle, dandelion; spray millet; small seed mix such as: millet, canary and smaller amounts of oats, buckwheat, safflower and little hemp; soaked and sprouted sunflower seed; cooked beans and pulses, boiled maize, and complete kibble. Provide lots of toys to keep these active birds busy such as puzzle toys, foraging toys and branches, bird-safe woods and heat sterilized pine cones, vegetable tanned leather chew toys. Provide area for bathing. Nest log or 7" x 7" x 24" (17.8cm x 17.8cm x 61cm) vertical box. The primary threat to this species is the wild bird trade. Habitat is also being lost through logging, agriculture, and overgrazing. Persecution as crop pest may be significant. Found in SW Ecuador and extreme NW Peru. Seen in variety of wooded habitats up to 1500m (4950 ft). Prefers primary deciduous woodland with Ceiba trichistandra but will also reside in degraded and secondary forests, premontane dry forest, arid Acacia scrubland and farmland with large trees next to forest. Also has been seen in banana plantations. Feeds on flowers and seeds of large trees including Erythina, Chorisia and Cavanillesia plantifolia, Cecropia catkins, Ceiba fruits and Ficus figs. Will sometimes feed on banana. Found in pairs and flocks of up to a dozen, but rarely seen in groups of hundreds (less so in recent years). 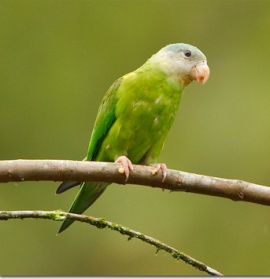 Will sometimes associate with other species of parrots including Red-masked Conures and Bronze-winged Parrots. Breeding is likely to coincide with the wet season. 4-5 rounded eggs, 23.0 x 18.0mm (0.9 x 0.7 in).